Prior to re-joining UBC in 2011, I was at Simon Fraser University for 21 years, where I served as Associate Dean, Director of the Institute for Studies in Teacher Education, and a Faculty Senator. For three years (2007-2010) I also served as the representative of the Association of British Columbia Deans of Education (ABCDE) on the BC College of Teachers. My scholarly interests in curriculum and pedagogy focus on how education practitioners think about their work and construct their professional knowledge and expertise. My earlier work studied how teachers use processes like reflection and action research to enhance their understanding of practice. This focus was embellished to examine how teachers’ professional commitment and identity is influenced by the socio-political-cultural contexts in which they do their work. This long-term research program has been regularly funded by SSHRC since 1985. For five years (2002-2007) I was a co-investigator of a Major Collaborative Research Initiative (funded by SSHRC) looking at the impact of policy changes on conditions of teaching in schools in five metropolitan areas of Canada (Halifax, Montreal, Toronto, Saskatoon, and Vancouver). More recently, my interest has been in a post-re-conceptualist understanding of practice, focusing on the enactment of re-conceptualist curriculum discourses in classroom teaching and on the policy context that circumscribes, and often impedes, their connection to practice. 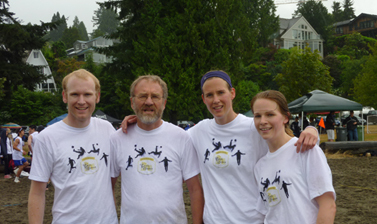 Here is Peter Grimmett with three of his four children after they had just played two games of beach soccer at Spanish Banks on a wet weekend in August 2010. David, his second son (far left), had organized the Caffe Umbria team and seconded his Dad to play at the last minute when they were short. Abigail (centre right) still plays senior women’s soccer and Deborah (far right) no longer plays competitively to concentrate on her blossoming career as a pianist. Peter decided to skip the third game (he was shattered) which led to a lot of family banter. His children claimed he could no longer hack the pace. He counterclaimed that it was his soccer experience and positioning sense that had kept the team from losing. Peter lost the argument! Grimmett, P.P. (In progress). The professional governance of teacher education: Principles and pitfalls. Contract with Routledge. Grimmett, P.P., & Dockendorf, M.E.J. (In progress). Exploring the labyrinth of practitioner inquiry. Lulu Press: Raleigh, NC. Grimmett, P.P. (In press, 2017). Two groundbreaking ideas of William F. Pinar: Curriculum as complicated conversation and Study as the site of education. In M.A. Doll, (Ed. ), Festschrift celebrating the 70th birthday of Professor William F. Pinar. Young, J.C., & Grimmett, P.P. (2015). Canadian research on the governance of teacher education. In T. Falkenberg (Ed. ), Handbook of Canadian research in initial teacher education (pp 129-150). Ottawa, ON: Canadian Association for Teacher Education. Grimmett, P.P. (2015). Academic leadership: Careerism with a sense of calling. In Clift, R.T., Loughran, J.J., Mills, G., & Craig, C. (Eds. ), Inside the role of Dean: International perspectives on leading in higher education (pp. 81-95). New York, NY: Routledge. Grimmett, P.P. (2015). Re-visioning decision-making in educational leadership. In S. Chitpin & C. Evers, (Eds. ), Decision-making in educational leadership: Principles, policies and practices (pp. 110-128). New York, NY: Routledge. Hubball, H., Clarke, A., Hoon, C.H., & Grimmett, P.P. (2015). The scholarship of educational leadership in research-intensive contexts: Institutional implications for promotion and tenure supervision. Asian Journal of the Scholarship of Teaching and Learning, 5 (2), 92-107. Grimmett, P.P., & Young, J.C. (2012). Teacher certification and the professional status of teaching in North America: The new battleground for public education. Charlotte, NC: Information Age Publishers (219 pages). Grimmett, P.P. (2012). Global teacher education: Liberalism and cosmopolitanism in a different form or post-modern trans-nationalism? In M-K. Shin (Ed. ), 2012 Global education symposium (pp. 92-115). Incheon, South Korea: Gyeongin National University of Education. Grimmett, P.P. (2012). Nourishing and invisibly repairing the minds of global educators with curriculum theory. In M-K. Shin (Ed. ), 2012 Global education symposium (pp. 186-200). Incheon, South Korea: Gyeongin National University of Education. Grimmett, P.P., & Halvorson, M. (2010).From understanding to creating curriculum: The case for the co-evolution of re-conceptualized design with re-conceptualized curriculum. Curriculum Inquiry, 40(2), 241-262. Grimmett, P.P. (2009). International teacher education: Liberal cosmopolitanism re-visited or postmodern trans-nationalism? Teacher Education Quarterly, 36 (4), 7-22. Grimmett, P.P. (2009). The governance of Canadian teacher education: A macro-political perspective. In Riches, C., & Benson, F.J. Entering into conversation about ideas in teacher education (pp. 20-32). Counterpoints, Studies in the postmodern theory of education, 334, J. Kincheloe & S. Steinberg, (Eds.). New York: Peter Lang. Grimmett, P.P., Fleming, R., & Trotter, L. (2009). Legitimacy and identity in teacher education: A micro-political struggle constrained by macro-political pressures. Asia-Pacific Journal of Teacher Education, 37 (1), 5-25. Grimmett, P.P., & Chinnery, A. (2009). Bridging policy to professional pedagogy in teaching and teacher education: Buffering learning by educating teachers as curriculum makers. Curriculum Inquiry, 39 (1), 125-143. Grimmett, P.P. (2008). Canada. In T. O’Donoghue & C. Whitehead, (Eds.). Teacher education in the English-speaking world: Past, present and future (pp. 23-44). Charlotte, NC: Information Age Publishers. Grimmett, P.P. (2008). Teacher education governance, policy, and the role of the university. In T. Falkenberg & H. Smits, (Eds. ), Mapping research in teacher education in Canada (pp. 41-58). Winnipeg: University of Manitoba. Grimmett, P.P. (2007). Mentoring teachers in Anglophone Canada: Building learning communities. In M.V. Zuljan & J. Vogrinc, (Eds. ), Professional inductions of teachers in Europe and elsewhere (pp. 137-153). Ljubljana, Slovenia: University of Ljubljana. Grimmett, P.P. (2007). Where policy meets practice in different social contexts: A comparison of the British Columbia context with those of England, the USA, and Finland. In S. Saari & T. Varis, (Eds. ), Professional growth: Festschrift for Professor Ruohotie (pp. 373-388). Tampere, Finland: University of Tampere Press. Grimmett, P.P., Brown, D., & Nixon, G. (August, 2007). Report of the Degree Qualification Assessment Board (DQAB) Review panel reviewing the University of Oregon application to offer permanently in the province a Master’s of Science program in Educational Leadership. Victoria, BC: Ministry of Advanced Education. Grimmett, P., Purkis, M., & Ungerleider, C. (January, 2007). Report of the academic program review team on the Department of Curriculum and Instruction in the Faculty of Education at the University of Victoria. Victoria, BC: Office of the Vice-President, Academic and Provost, University of Victoria. Grimmett, P.P., McKee, W., & Pudlas, K. (January, 2007). Report of the Degree Qualification Assessment Board (DQAB) Review panel reviewing the Gonzaga University application to offer permanently in the province a Master’s of Arts program in Teaching At-Risk Students. Victoria, BC: Ministry of Advanced Education. Grimmett, P.P., & Echols, F.H. (2006). What say we dance but this time with music:Review of the provisions of Regulation 347/02, Accreditation of Teacher Education Programs in Ontario. Toronto, ON: Ontario College of Teachers. Grimmett, P.P., & Ruohotie, P. (2005). Professional growth and policy conditions. Tampere, Finland: University of Tampere Press. Grimmett, P.P. (2005). The impact of public policy on teaching and teacher education. In H. Niemi, (Ed.). Life as learning. Helsinki: University of Helsinki Press. Grimmett, P.P. (2005). L’impact des politiques publiques sur les conditions d’enseignement. In Biron, D., Cividini, M., et Desbiens, J-F. (Eds). La profession enseignante au temps des reformes. (pp. 59-72). Montreal: CRIFPE Press (University of Montreal). Ontario College of Teachers funding, $51,250 (with Frank Echols, UBC) to study the accreditation process for teacher education programs in the province of Ontario. SSHRC MCRI $2.5 million for study of impact of policy on practice (with researchers from Montreal, Toronto, Québec, Saskatchewan & UBC). BC Ministry of Education, $30,000 for study of patterns of teacher supply and demand in the province of British Columbia (with Frank Echols and Andrew Kitchenham). Social Sciences and Humanities Research Council of Canada (SSHRCC) grant # 410-95-1071, $166,000 for three-year study of how pre-service teachers develop the practice of teaching. 17 PhD, 12 MA, and 45 MEd students supervised to completion. One doctoral student in progress.